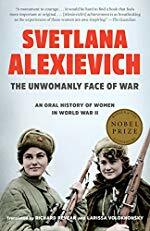 Alexievich chronicles the experiences of the Soviet women who fought on the front lines, on the home front, and in the occupied territories. These women—more than a million in total—were nurses and doctors, pilots, tank drivers, machine-gunners, and snipers. They battled alongside men, and yet, after the victory, their efforts and sacrifices were forgotten. Alexievich traveled thousands of miles and visited more than a hundred towns to record these women’s stories. Together, this symphony of voices reveals a different aspect of the war—the everyday details of life in combat left out of the official histories. "A human being is greater than war..." writes Alexievich. Her project here is an intimate, gendered history of life at war. "I write not about war, but about human beings in war. I write not the history of a war, but the history of feelings. I am a historian of the soul. On the one hand I examine specific human beings, living in a specific time and taking part in specific events, and on the other hand I have to discern the eternally human in them. The tremor of eternity. That which is in human beings at all times." Excerpt from the beginning of the book. I read the 2017 English translation by Richard Pevear and Larissa Volokhonsky. Previously editions/translations were heavily censored, and that censorship is discussed by Alexievich in this edition. I thought this was a riveting read. I'm not drawn to many histories of war, but Alexievich's approach, and her thoughtfulness about mediating memory, drew me in. I don't think this is about romanticizing war, but it also doesn't shy away from how Alexievich is intently interested in the human soul. This is the first book I've read by Alexievich, and I thought the oral history structure was powerful. Alexievich's process of interviewing, and her process of understanding what she was doing, was fascinating, and the stories themselves demonstrated an immense range of experiences while still highlighting the commonalities. I think I grieved my way through this whole book. A passage about Alexievich's witnessing: "And I also become a witness. A witness to what people remember and how they remember, to what they want to talk about and what they try to forget or remove to the furthest corner of memory. Curtain off. How they desperately seek for words, yet wish to reconstruct what is gone in the hope that from a distance they may be able to find its full meaning. To see and understand what they hadn’t seen and understood then. There. They study themselves, meet themselves anew. Most often it is already two persons—this one and that one, the young one and the old one. The one in the war and the one after the war. Long after the war. The feeling that I am hearing two voices at the same time never leaves me…"
This sounds fascinating- it's definitely going on my to-read list!